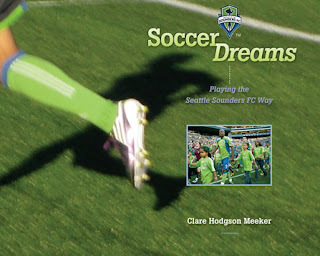 On Saturday I attended an author reading/event at Secret Garden Books in Ballard, featuring my friend Clare Hodgson Meeker reading from her book Soccer Dreams, and author/illustrator Jesse Joshua Watson with his picture book, Hope for Haiti. 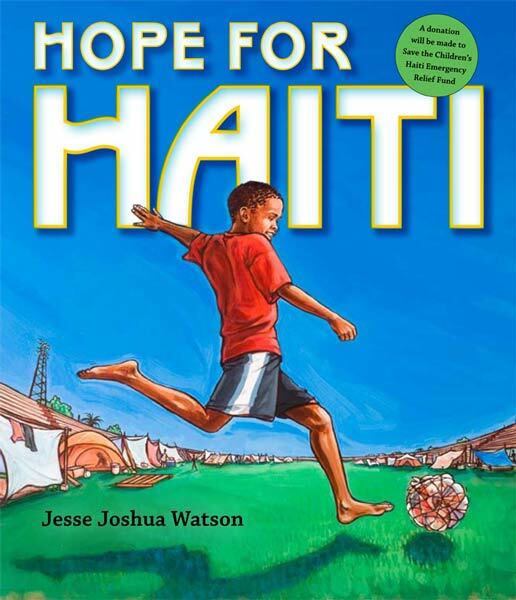 Both books center around the game of soccer, and bring out inspiring, world-broadening themes that children can relate to on emotional, imaginative and physical levels. Jesse's book deserves a wider audience than it has so far received. Haiti's misery in the aftermath of its devastating earthquake has largely disappeared from the media and hence from the minds of most Americans. As Jesse said at his reading, on this small island just a short hop from our shores "the quality of life is beyond bad, it's just shameful, it's so difficult there. 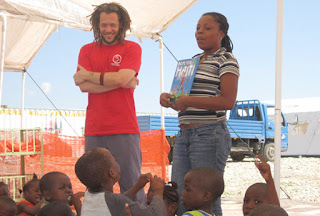 So I just want to help our kids understand something about what's going on in the world." Like Soccer Dreams, Hope for Haiti uses the internationally popular game of soccer as a vehicle to express hope and build bridges between children of incredibly different backgrounds, but who can relate experientially, as children so readily do when given the opportunity, through play. 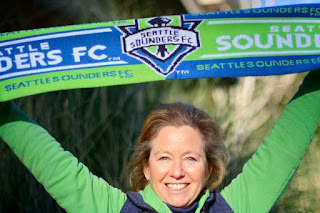 Soccer Dreams creatively weaves fiction and non-fiction, a trademark of Clare's style evident in earlier books like Hansa: The True Story of an Asian Elephant Baby and I Could Not Keep Silent: The Story of Rachel Carson. Soccer Dreams tells the story of Todo, a boy from a Nairobi, Kenya who plays soccer in an empty lot with a ball made of plastic bags wrapped in twine. When his family moves to Seattle, Todo gets recruited onto a neighborhood soccer team, and begins to learn about much more than soccer as he transitions to his new culture and home, facing universal challenges of childhood and growing up. 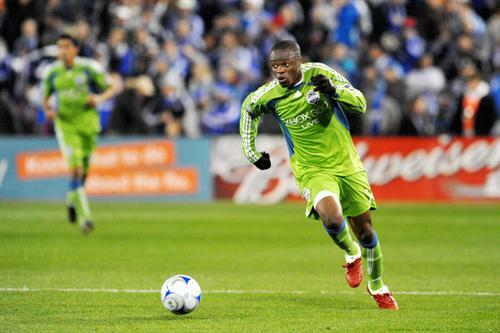 Todo is based on the real life story of a Kenyan boy, Tolosa, an avid soccer player and now high school student in Seattle. The parallel story in Soccer Dreams consists of profiles, photos, and quotes from Seattle Sounders players, which complement the narrative of Todo's journey. The result is a unique combination of fan-book, picture book, and inspirational resource for kids, parents, and any sports-minded reader. Even I, who am no more a sports fan than a nuclear scientist, am drawn into the story and its message, and at events like Saturday's reading and book signing (which also featured opportunities to make soccer balls out of plastic bags and string) I was swept up in the soccer fever and excitement filling the bookstore. Both Jesse's and Clare's book are great for kids, for soccer lovers, as gifts or to share in families and among friends. Support your local bookstores, and buy a copy! By the way, Seattle Sounders star player Steve Zakuani was also at the bookstore event, signing books, autographing soccer balls and shirts, and making a humble pitch for his foundation, Kingdom of Hope, through which Steve is helping low income children and youth discover the life-changing possibilities of cooperation, teamwork, diligence, and fun through the great game of soccer. All these creative efforts to use sports, writing, and imagination to inspire children as readers, team players, and world citizens, are worth lending our support! 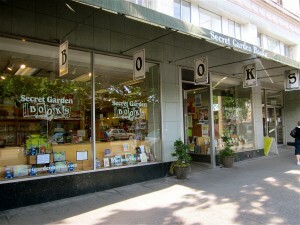 For that matter, so are independent bookstores like The Secret Garden Bookshop!